Sir Rudolf Peierls was a German-born physicist. He worked with Wolfgang Pauli in Switzerland, and moved to England when Hitler rose to power in 1933. In March 1940, Peierls and fellow colleague Otto Frisch co-authored the Frisch-Peierls memorandum, the first technical exposition of a practical atomic weapon. 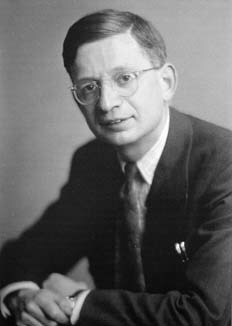 Peierls joined the British Mission and worked on the Manhattan Project in New York and Los Alamos. In this interview, Peierls discusses his work in atomic research and how the Frisch-Peierls memorandum was developed. He recalls going sailing with Oppenheimer, and how the scientists at Los Alamos respected Oppenheimer’s leadership. Peierls: There were not many people there on a long-term basis. That summer, I can really only remember people who were sort of in and out. But they included, besides Oppenheimer, for example [Isador I.] Rabi. Peierls: No. Felix Bloch, who was still in Leipzig, but his home was in Zurich. He appeared from time to time. Of course, [Paul] Scherrer was the experimental physicist. Sherwin: I'm not familiar with him. Peierls: Oh, he's a quite distinguished experimental physicist, S-C-H-E-R-R-E-R. He's known in physics through the Debye–Scherrer method of x-ray analysis. He was at the university at the time, Wentzel. Peierls: University of Zurich. I was at the ETH, the federal college of technology that Pauli was. That was the center of physics. But the university also had a physics department. The professor there was Gregor Wentzel, late of [00:02:32] Chicago. Sherwin: Now what were you working on at the time? Peierls: I was writing my PhD thesis on solid-state physics. This was on the heat conduction in insulating crystals, where the heat is conducted by lattice vibrations. [00:02:51] Phonon, phonons, we called it. Sherwin: Were Rabi and Oppenheimer and others working on any related topics? Peierls: No, not really related. Everybody at that time was interested in the latest things in quantum theory. Because this was still so recent, that everybody knew everything that had been done in quantum mechanics. So there was always common ground. But I think they were visiting for short periods, and treated it more like a holiday or something. They weren't sitting down to do any systematic work while at Zurich. Sherwin: —in physics at the time, and it held a possibility of opening up all sorts of interesting questions? Peierls: No, on the contrary. The main element at the time was answering questions, which had been mysteries for generations. Sherwin: What were some of these questions, for example? Peierls: Well, up to then you have the old quantum theory of [Max] Planck, [Niels] Bohr's, or [Michael] Faraday, which contained some of the right answers. I mean, there was enough agreement to show what was on the right lines. At the same time, it was self-contradictory to some problems; gave nonsense answers; to others, it gave no answers at all. There were lots of problems in atomic physics or relating on the atomic scale, which we just could not answer. One of these was in the electron theory of metals, which I just about started then, which I got later interested in. My first paper was on that. You had a mixture of things, which confirmed the old theory of electrons running around the metals by carrying the electric current. Together with thickness, this is also clearly contradicted there. For example, on the old physics, you would have expected that the electrons would contribute to the specific heat. So a metal should have a higher specific heat than a non-conducting solid. That wasn't true. Peierls: At the same time, you have the Wiedemann-Franz relation, which ties the electric and thermal conductivities as a fixed ratio between those. And in deriving that, you had to invoke the fact that the electrons had the specific heat, which other experiments had shown they did not. You had the hole effect, which said that if you put an electric conductor current, an electric current, into a magnetic field, the electrons get deflected sideways and you get a natural potential difference. This indeed happens. But in about half the metals, the affected are the wrong sign, as if the current was being carried by a positive current instead of negative ones. This is typical almost in every field whether you take molecular, spectral atoms, or solids, or radiation. You get these paradoxes. Then when the new mechanics came in, then within a few years, you just looked and picked up any problem that nobody else had looked at yet. With any such paradox, you probably found that it was now all right and you could understand it. Sherwin: Now, what was the difference between the two mechanics? What was the insight? This is [Werner] Heisenberg. Peierls: Heisenberg, Dirac, [Erwin] Schrodinger. It was really a fundamental revision of our basic concept of space and time and motion which was necessary. Sherwin: Could you explain in a few sentences how it was fundamentally revised? I mean, what did it look like before? Peierls: I think we now characterize it by the uncertainty principle. But there are two facts. One is that whereas in the old physics, you thought that light consisted of waves and other things like electrons were particles pictured as points, or charges or small objects moving a lot. One now realized that both electrons or both material things and life have some wave properties. That is one of the new things that had to be digested. This is connected with the uncertainty principle, due to Heisenberg in the first place and elaborated by Niels Bohr. It says that not all the concepts pictured in thinking about the motion of particles really make sense, because there are fundamental limitations to what can be observed. In particular, the more accurately you observe the position of the other particle, the less accurately you can know its momentum and velocity. Sherwin: The act of observation changes? Sherwin: You change the orbit. Peierls: You change the orbit. Now, I don't think I can give a lecture on all the implications. But I think you get the idea. That is a kind of change which came out well. It came out first through mathematical formulas, started by Heisenberg in terms of trying to describe everything in terms only of things he knew, but observable. And by Schrodinger, in terms of setting up a wave theory of the electrons. It turned out then that the two things could be shown to be equivalent, and you get the same answers. And then later on, one understand it in terms of these concepts. Sherwin: So this was the real turning point in physics? Sherwin: Certainly in the twentieth century. Sherwin: How would you compare it to previous turning points? Peierls: Well, there was of course also in twentieth century, the other great turning point of relativity. It was not directly connected with the quantum theory. It was equally fundamental, though giving not as many immediate practical consequences. Quantum theory affects all we know about matter, and allows us then to exploit this and do things which are based on that. Whereas the practical implications of relativity tend to be more remote. Sherwin: Would it be right to say that the discovery of relativity, both specific and general, was necessary for the age of space travel and the kinds of things that are being done there? Whereas quantum mechanics was necessary for what? Peierls: Well, it was necessary for an awful lot of things. For example, the understanding of nuclei, which then leads to nuclear energy. But not only that—understanding of solid state phenomena, electronics. The transistor was in fact based on a development that started off as theoretical ideas based on the quantum mechanics of electrons and semiconductors, in that case, and then of course was developed. That could not have happened without it. Sherwin: Would nuclear fission have happened without quantum mechanics? If it hadn’t been discovered? Peierls: I suppose it could. People would have been very uncomfortable, because they wouldn't have any simple interpretation of what was going on. But purely empirically, I could imagine that if people had developed accelerators. One interesting thing that’s only a step, but the earliest accelerator was built and used by [John] Cockcroft and [Ernest] Walton in Cambridge. Sherwin: Was that in the teens? Peierls: No, no, that was in the '30s. Sherwin: Oh, as late the ‘30s. Peierls: Yeah. Lawrence already had the cyclotron in those days. Peierls: But he did not try to use that to bombard nuclei with accelerated particles, because nobody expected that they could penetrate in the nuclei, until you got much higher energies. Now, it was quantum mechanics and the use of computational quantum mechanics to the alpha decay of nuclei which taught one that in quantum mechanics, a particle can get through a region of a repulsive force, where in classical physics it couldn't get. This was known and understood in Cambridge by [Ernest] Rutherford in particular. He therefore insisted that the people who are building the accelerator use it immediately, even with these relatively low energies, to try and disintegrate nuclear. And they succeeded. Sherwin: What made Rutherford so skeptical of nuclear fission, or the possibility of, let's say, building a bomb? Peierls: Oh. Well, everybody was skeptical. Most people were skeptical. Fission was a new and unsuspected phenomenon that in Rutherford’s lifetime had not been discovered, and that made it possible. Sherwin: He died in '37? Sherwin: Oh, right in there. I know it was discovered very shortly after. Sherwin: Okay. Well, now back to 1929. What I'm trying to do is get a sense of the kinds of issues that excited the people who were there at the time. Peierls: I think what everybody was trying to do then, amongst the theoretical physicists of course, was to understand the new ideas sufficiently and their implications for various phenomena, to clear up the remaining difficulties. There were still quite a lot of difficulties remaining. There was a tremendous optimism, because it now looked as if everything would fall into place. Then it came as a great surprise, and disappointment maybe, that things like electrodynamics still didn't work. There were troubles arising from the electron being essentially a point charge. In classical physics, a point charge has an infinite energy in the field around it. Now, so many infinities had gone that one might think this one would go, too, but it didn't. It was only in the postwar years, in the ‘50s mainly, or late ‘40s, that one learned how to get around that. Peierls: Well, everything was very informal. The numbers were smaller, and therefore people knew each other between different places. Oppenheimer I think had previously been in Gottingen with Max Born, and probably been there before him. Sherwin: What was the day like, for example? Did everybody have an office? Would this be at the University of Zurich? Peierls: No. It was a federal school of technology. Sherwin: Okay, that's where you worked? Sherwin: So this was your home institution? Peierls: Right. Well, I mean I was a student back then. Peierls: I went there and stayed later as Pauli’s assistant. I don’t think I had an office to myself. I think I had a desk somewhere in some room or something. Sherwin: Was it a campus? Was it a building in the middle of the city? Peierls: Building in the middle of the city. Peierls: No, a relatively modern, I mean, modern for that time. I think it probably dated from, I would say, early twentieth century. It was a fairly large physics building, containing mainly physics. I think the top floor was meteorology, something like that. Or what you would probably call today communications engineering. Engineering in weak currents. Sherwin: Was engineering and physics together in the same building? Peierls: Only this part, the currents, were in the same building. Pauli had an office, of course. He didn't have a secretary, but he could get letters or papers written occasionally by the secretary of Scherrer, who was the head of the department. Peierls: Pauli never got up very early. He used to come in about noon maybe or 1:00, and look at his mail, and then one would go to lunch very often. Everybody would go together for lunch, except that Pauli had quite high standards in what he liked to eat. Many of us couldn't quite afford that every day. There was differences. Sherwin: What kind of restaurants were in town? I mean, was it coffee shops? Peierls: Well, the coffee shop is an American concept. Peierls: There were all kinds of restaurants, ranging from the very awful student cafeteria to quite very elegant restaurants. Sherwin: Were they long leisurely lunches? Peierls: It varied. If you went with Pauli, it tended to be a respectable place where it might be quite slow. If you were not in the mood for that, you might go to a place where you were served quite quickly. I remember the name of one place where I sometimes went. I don't think Pauli would ever go there. It’s a little café. Because of its name, it's called Friday, which means “the peaceful corner.” But it's spelled exactly like Friday. That is why the name stuck. Sherwin: And there was a lot of discussion of physics, I suppose, at these? Peierls: At the lunches? Not always. It might come up, but in general, it's hard to discuss physics without a blackboard or a supply of paper. Sherwin: So, writing all over the tablecloth? Peierls: No. I think in general, somebody might have come up with an idea. But I would say more often, they would be more general topics. Sherwin: What was Pauli like at that time? How old was he at that time? Peierls: How old was he then? Late twenties, maybe thirty. Sherwin: Oh, he's that young? Sherwin: Was he already an eminent figure in physics, or was that to come later? Peierls: Oh, absolutely. Because first of all, he had already previously written his paper about the Pauli Principle called Pauli Principle, for which he eventually got the Nobel Prize but very late. But he also was known that when he was a student, not so long before that, he had written a thesis, which was probably the most sophisticated attempt to solve a problem with the old quantum mechanics. It was very complicated, old quantum theory, which in fact turned out to show that it didn’t work for that particular [inaudible]. While he was doing that, he was writing a review article about relativity in his spare time, so to speak, which is still today one of the best introductions to the subject. Sherwin: Right. Do you remember the title? Peierls: The title I don't remember, but it's in a German book called the Encyklopädie der mathematischen Wissenschaften, The Encyclopedia of Mathematical Sciences. It's just one article in that, which is how it was republished in English in the '50s. Any library under Pauli would lead you to that. Now, if you want more about my impressions of Pauli, there is a lecture I've given on many occasions. The first time it was published in a peculiar place, so you might care to look that up because I try to describe Pauli in some detail there. Sherwin: I'll have it on the tape. Peierls: These are the proceedings of the summer school in Erice. That’s in Sicily. It was an annual summer school on high-energy physics. It probably, in any library, would be listed either under Erice or under the name of the man who runs the course and who was the editor of the proceedings, was called Zichichi. In the 1974 volume, this lecture of mine appears. Also, I wrote the Pauli biography for the Royal Society after he died. That has more details, in particular the scientific work and personality. That’s a series called Biographical Memoirs of Fellows of the Royal Society. Sherwin: Yes, I've used that actually. I read the Bohr one in there. Peierls: The Pauli one, I don't remember the date. Sherwin: Any recollections of Oppenheimer's time at Zurich at all? Do you remember first meeting him? Peierls: One obviously was impressed immediately by the extent to which he—by his being so articulate. Also by his speed of understanding. That I think I realized even at that first occasion. Sherwin: How about personally? Oppenheimer's about twenty-four at this time, and I had a chance to read a whole series of letters that he wrote to various people. Alice Smith and Charles Weiner are putting together this volume. There’s an interesting change that occurs at the point in which he begins to teach. He really moves, it seems to me, through the letters from very much a sophomoric approach to letter-writing to friends. He really does seem like an immature college student in many ways, to very soon afterwards, you are reading the letters of an adult. Peierls: I don’t think I can comment on that because first of all, I didn't really know him well enough to get into details of that kind. Secondly, I was very young myself at the time, and did not have the understanding that would have brought out these features. I remember one remark made by Pauli, who knew, of course, that Oppenheimer was actually quite well off. I don't know if this was true, but Pauli told me that when he traveled in Europe, he always had with him some pictures and carpets to make the places where he was staying reasonably effective. That had struck Pauli as a—well, I don't know whether he was more struck by the aesthetic standards or by the luxury implied by that. I don't think that would have applied at Zurich, because he was there for such a short time. Sherwin: Yeah, just traveling through. Sherwin: Did Oppenheimer know Rabi before that, or is that where they met? Do you recall? Peierls: I do not know. Sherwin: And how about Bloch and the others? Peierls: I don't even know whether he encountered Bloch, because Bloch at that time tended to come up for short visits. For example, in my first summer in Zurich there was a week’s conference on nuclear physics. Bloch came up for that, but I think Oppenheimer hadn't got to Zurich by that time. So whether they ever overlapped, I do not know. Sherwin: Right. You said that you were impressed by his ability to learn things so fast. Was it seminars that you saw him at? Peierls: No, because there were not many seminars. In conversation, not learn things so fast, but to understand so quickly what you are saying. Now, again, it's not easy to separate my early impressions from later ones. Peierls: This was characteristic of him, that when you talked with him, you would never finish a sentence because when you were halfway through the sentence, he already knew what you were saying and had the answer. Sherwin: Do you have any example that – no. Sherwin: No such luck. So he was there for about what, two or three weeks at a time? Peierls: Probably more than that. But I don't remember. The one tangible recollection I have is that—I was very fond of sailing at that time, and used to rent a sailing boat to go out and persuaded other people to come along. There is one picture I have showing Oppenheimer, Rabi, Pauli, and a couple of other people on the sailboat. Sherwin: That's a pretty good-sized sailboat. Peierls: Yeah. Of course, these are short trips on the lake; it didn’t have cabins, or anything like that. I think I took that picture, because I'm not on it. That was reproduced by the American Physical Society. They have one calendar with this picture. Sherwin: I saw that as a matter of fact, just about a week ago. I was up there looking at Frank Oppenheimer's oral history. I looked through the calendar and I saw this group. That's your picture? Peierls: Yeah. I might have forgotten that, but therefore I do know positively that I took Oppenheimer, Rabi, and Pauli sailing. Sherwin: Do you have any impressions of him as a sailor? Sherwin: Because he actually loved sailing. Peierls: I know, and that's why he could easily be persuaded to come along. It was a short trip, and we presumably took turns at the helm. Sherwin: Right. But you didn't do a lot of this with him? Peierls: No. That may have been the single occasion, when that picture was taken. It might have happened a few times, I just can’t remember. Sherwin: Now, the next time that you saw Oppenheimer was 1942? Sherwin: Is that right? Actually, before we go into that, I would like to ask you about your breakthrough with [Otto] Frisch on the principle of how to get uranium-238 to 235, and therefore construct an atomic bomb. Peierls: Yeah, separate [uranium] 238. Sherwin: How did that come about, and why were you working on it? Peierls: We weren't working on it. Frisch, remember, had been involved in the discovery of fission, or at least it was he and [Lise] Meitner who tumbled to the explanation. He made an experiment to verify that explanation. So naturally, he was very interested in the fission problem, and also naturally was thinking about whether this could lead to a chain reaction, which everybody was thinking about. There came then the paper by Bohr and [John] Wheeler, which showed that the main effects observed in normal natural uranium were due to the [uranium] 235. If you thought that through, then it became clear that the chain reaction in natural uranium was not possible by itself. Peierls: Then it would work only with—if it worked with slow neutrons, you had to have a moderator to slow down the neutrons. Once they are slow, any reaction wouldn't be very violent because as a chain reaction built up, the energy released would lower the piece of your uranium part of the reaction and stop it before it got very far. At that time, I had been interested just in the theoretical part, the sort of mathematics, not the chain reaction. At first, it wasn't obvious to me that there would be such a sudden and drastic difference between the thing being just a little under critical size or just a little over critical size. There was a paper by a French physicist, Francis Perrin, who had worked it out in mathematics, but in a rather crude approximation. Sherwin: You weren't sure whether to publish it because you felt that it was not good enough? Sherwin: Right, everybody was worried about it. Peierls: Yeah. I'm not sure that if I had realized it had some realistic implications, that I might [inaudible]. I don’t know. I didn't get that far, because then Frisch explained to me that one could conclude from the Bohr and Wheeler paper that a fast chain reaction was not practical. Peierls: 235. Which of course, then seemed like a sort of science fiction situation. Isotope separation was something that people's great pride had done in microgram or milligram quantities in the lab, was very, very different in cases, which was not easier than pure uranium. We discussed this. I had the formula handy in my paper for the critical size. We had to guess the nuclear cross sections for neutron causing fission in uranium-235. But again, the Bohr-Wheeler theory gave a fairly clear lead there. We could make a guess and then draw a bit amazement. We found that the critical size was very small, not in terms of the tons we would have guessed intuitively. Because those are the quantities you get involved in when you think of modern uranium. But the concentration of 235 makes a vast amount of difference. It was in the matter of a few pounds. Our estimate was not right. It was not far. Peierls: Our estimate was not precise. Peierls: We had overrated the cross section somewhat. In other words, we would have taken Bohr and Wheeler too literally there. But against that, we had omitted the possibility that one would of course surround—not take the [inaudible] of uranium-235, but surround it by a reflector of ordinary uranium and that would reflect back some of the neutrons and the protons. Therefore, altogether, our estimate for the critical size was not very far. We got rather excited about that, and then said, “Now, let's see what would happen if you really started a chain reaction.” Again, with quite rough or crude arguments on sort of a back of an envelope, we convinced ourselves that the efficiency would be quite high, that quite an appreciable fraction of the very efficient energy would be released before the material got dispersed. At that point, we said, “Well, this is very important because this means for warfare, this will be an extremely revolutionary weapon that can be done.” We said in a great understatement, “Even if the isotope separation plant costs as much as a battleship.” You could have built many battleships with that. Sherwin: Yes. Well, of course since they used four processes for the isotope separation, it was over two billion dollars ultimately. Sherwin: Right, of course you couldn't, but if you did just to be crude about it, you weren’t that far off. Sherwin: Not today, but maybe then. Peierls: Then we sat and wrote everything down. Sherwin: But you didn't publish it? You submitted it to the MAUD Committee? Peierls: No, that didn't exist. We wrote it up as a secret document, and gave it to all the faculty who was a physicist; for example, a senior physicist in Birmingham who was involved with nuclear things. We were not. He passed it on to the government scientists. It landed in a committee of physicists we then didn't know which had studied the uranium problem, and just comes to a conclusion that there was nothing that could be done in wartime and was about to wind up. Sherwin: That had happened in America, too. I gather it happened in Germany. Do you have any of your own ideas about why the Germans never got to the stage that you had done? The Bohr-Wheeler paper was published. Peierls: It is not clear whether the Germans ever asked the question in the form in which we came to ask it. Namely, what is exactly the effect of when you have separate isotopes? What is the harm of [inaudible]. Peierls: I think knew enough physics to answer what they were asking. But you do not necessarily ask about the effect of the pure isotope, because it's such an impractical thing. You rush, and you don't tend to ask about the cost of isotope separation on a very large scale, until you've seen how easy it is once you got it and how powerful the effect. But let me say that Heisenberg himself says that they knew this might not work. In fact, there is a reference to a meeting in Germany where Heisenberg was asked how big would be an atomic bomb if they could make one. He said it would be about the size of a football. Sherwin: Field? Oh, about the size of a football. Peierls: Yeah. Now, that is perhaps a little larger depending on what kind of football you have in mind, but it certainly in the right vicinity. Sherwin: That’s for the amount of U-235, not the whole bomb? Peierls: Yeah. Now, taking what Heisenberg said himself, that they realized the possibility, but also realized it would involve a tremendous effort. That was not practical for Germany to try to do that in wartime. He says he was unlucky. Truly. in a way, he was right in that because even the Americans with their bigger resources and less disturbance from war didn't finish it before the end of the war nuke. Peierls: Now, perhaps one couldn't have been quite so sure at the beginning of what it would involve. Sherwin: Yeah. The reason I'm skeptical about Heisenberg's explanation of all this is that in David Irving's book, the German Atomic Bomb—are you familiar with that? Peierls: Right, this is probably true, but to get access to these transcripts is very difficult. There is a background, because first of all, what took them by surprise—they were first incredulous when they heard the news. They thought it must be a bluff, until they had details. They just did not believe that the Americans would make this enormous effort. Heisenberg in his own book says that we overestimated the technological effort involved. Peierls: That point of shame was not that they didn't do it, but that they had been so sure the Americans couldn't do it either. Sherwin: Couldn't do it, I see. Peierls: That's one thing. The other thing is, it's rather touching that they worked on their little heavy water reactor right to the bitter end. Even when the war was obviously lost for Germany and when the Americans and Soviets [inaudible], they were still working on their last experiments [inaudible]. Why? It was undue pride. Obviously by this time, the small experimental reactor for some neutrons couldn't have been of any practical significance. The motivation was—and Heisenberg said so—that they thought that if they had this tremendous scientific achievement of making a chain reaction, that would impress people with German science to such an extent that it might help them win possible conditions. Therefore, it must have been a very bitter disappointment to discover that, in fact, Germany did the same thing. Sherwin: I see. That's very interesting. I can see that. Of course, they were right in their thinking about it, because that certainly happened to [Werner] von Braun and that whole rocket team group. The British, Americans, and the Russians were all grabbing up these rocket engineers and taking them back. Given the situation in Germany, putting them up in a rather palatial—at least in America—situations. Peierls: Well, true. Of course, there the motivation was not so much to—well, in part of course, to get the benefit of their experience, but in part also to stop the other side. Peierls: And, of course, they did that with the nuclear physicists also. That was, after all, the reason why they were all on terms with England for now. Sherwin: Right, yes. Well, now to Los Alamos. Did you head up the British team at Los Alamos? Peierls: No, not at first. [James] Chadwick was the senior person. Sherwin: He spent a lot of time in Washington? Peierls: He traveled a bit, and then eventually he decided to move to Washington altogether. And then I took over and became the senior person, which didn't give me very much to do. Sherwin: Now, I'd like to try and find out as much about your Los Alamos experiences as you have time to relate, especially in terms of Oppenheimer, but also in general. First of all, let me ask you a question. Have you published anything on your years in Los Alamos? Peierls: No. I might do so one day. The basic thing is that everybody had enormous confidence in Oppenheimer as a leader. Well, I wouldn't say everybody, but most of us. Sherwin: [Seth] Neddermeyer, for example. Peierls: Yeah, and [Edward] Teller to some extent. In general, there was great confidence in his scientific judgment, and also very largely in his practical judgment. Of course, it was a surprise that he was chosen as the head of the [inaudible], and I think an even bigger surprise how well he managed that. Partly that was because he could stand up to General [Leslie] Groves and insist on the things that simply were essential. What he got, for example, in exchange for the remoteness of Los Alamos and travel restrictions and everything. He got the concession, right against Groves’ spirit, that within the place, information could circulate fairly freely. There was no compartmentalization of the scientific staff; they had to know what was going on. With the exception of a few things of immediate strategic or military secrets, like the external shape of the weapon, the kind of plane it would be carried on, all these kinds of things, which most of us weren't interested in. Sherwin: Do you remember when you first arrived at Los Alamos, how you got there, and when you first met Oppenheimer? Did you come with your wife? Peierls: I came for two brief visits to talk about something. For the second one, I already knew that later on we would be moved. The first one was just while I was still working in New York. Sherwin: You were working in New York where? Peierls: I was in consulting with the Kellex people who were designing the isotope plant. We moved to Los Alamos when it became too late to make any [inaudible]. Peierls: We arrived in New York in December '43, and moved to Los Alamos about June '44. Sherwin: That was when you moved there? Peierls: Yeah. First visit was earlier. I can’t recall the exact date. Sherwin: How long were you there for? Sherwin: How did you get there, train? Plane? From military plane? Peierls: No, commercial plane to Albuquerque. Peierls: Yeah. I was then picked up by a car. It was an all-night flight from New York to Albuquerque. Instead of arriving there and finding myself there in the morning, we hadn’t gotten quite as far I think as [inaudible] City when problems with planes. I had been given—I don't know how—a telephone number, and I tried to telephone Oppenheimer to say I was held up and would be late. [Inaudible] Then I was met in Albuquerque by car. Sherwin: Oh, so you did speak to Oppenheimer? Peierls: Yeah. But just to say my plane was late, and he said fine. Then I arrived late that day in Albuquerque. There were two roads, one official and somewhat longer, and a shortcut, which [inaudible]. We arrived by the shortcut after consulting various people about the state of the road. Then we got stuck in the mud. [Inaudible]. It was about 2:00 in the morning when we got to Los Alamos. After spending the previous night sitting on the plane, I was understandably sleepy. We got to the house of Hans Bethe, an old friend. And then presumably saw Oppenheimer the next morning. Sherwin: Was Rose Bethe there already? Peierls: Yes. She was, I think, just expecting her first baby. This was not the first time I saw Oppenheimer. But as you know, I saw him in '42, and again in '43. Sherwin: Actually, I didn't catch the '42 time. Peierls: '42 was the time when I was beginning to talk about collaboration between the United States and Britain on atomic energy. A few of us were sent over to my contact. We talked mainly to people at Columbia, Harold Urey and so on, and to people at U-Chicago. I went down to Virginia to talk with [Jesse] Beams, who was [inaudible] the centrifuges. Then I went out to Berkeley for a couple days to talk with Oppenheimer. It was not in any official capacity, but of course I was interested. Sherwin: Do you remember anything about the discussion in Berkeley with Oppenheimer? Sherwin: Tell me exactly what you mean about his having thought about the weapon. Peierls: That’s the question of the chain reaction with fast neutrons. What was the efficiency? What was the critical size? What were the limitations? What was the speed with which you have to assemble the parts to get a critical assembly? All these kind of practical problems. At that time some people, like explosives expert [George] Kistiakowsky, thought that maybe if it will release that amount of energy in a single bang, all the energy will go into heating air to ridiculous temperatures and will be wasted. You won't get a blast [inaudible] efficiency. Sherwin: Now, was Kistiakowsky out there at the time? Peierls: That's right. That was before I came over there. I saw his paper. Sherwin: Oh, he wrote a paper that said that? Peierls: Oh, no. That was a secret paper. That was I think off of [inaudible], and I was sent a copy. It was not very secret, because it didn't say that anybody was thinking of making such a weapon. Then G. I. Taylor, the great mathematician in England, wrote down an equation for that problem [inaudible] that showed that Kistiakowsky was wrong. Sherwin: Now had you discussed that paper with Oppenheimer? Peierls: I think he knew about Kistiakowsky’s paper and about G. I. Taylor's result. We agreed on them. We agreed. We agreed, I think, on most things. Sherwin: Did you do any socializing with Oppenheimer at that time? Peierls: I was staying with him. Sherwin: He was married at the time. How long did you stay there? Peierls: Couple of days. Two nights, maybe. Sherwin: This was the first time you met his wife, of course? Sherwin: Do you recall anything about those days? Sherwin: What was your impression of the house and the way it was furnished? Peierls: Very attractively, as one would expect. Sherwin: Rugs on the floor, pictures on the walls? Sherwin: Uh-huh. Okay, back to Los Alamos. Peierls: I saw him once again when we were over on a short visit. I guess you probably know there was an interregnum when there was no exchange of information. Sherwin:For example, were you there when Roosevelt died? That was April 12, 1945. Sherwin: Okay. Someone told me that Oppenheimer made a very moving speech at that time—not very long, but nevertheless very moving. Everyone was assembled in what was the auditorium or the equivalent of it. He or she could not remember a word of it, but just remembered the impressions of the period. Were you there? Peierls: I probably was there, and I vaguely remember that there was such a speech. Sherwin: Do you remember any meeting in which Oppenheimer's behavior, that is a description of it, would provide an insight into his personality, into his leadership? Any incident at all? Peierls: One thing, again fairly general. There was once a week a colloquium of all the scientific members of the lab together in the local cinema.This was the only place big enough to house our meetings. Of course, there was [inaudible] in that cinema, under very tight security. Each week, the talk would be given on one of the aspects of the development. Each time Oppenheimer, who was nominated chair, would preface this by making some brief remarks about recent events. When at last some separated [uranium] 235 had arrived that could be done to experiments, or was expected. Whatever had happened during the week which would interest people in general. He kept the people's interest in things alive by these few minutes of proceedings. It’s very hard to think of any specific features. I think I told you the story of [Lord] Cherwell’s visit? That was an anecdote. Sherwin: Yes, where Oppenheimer came up to you afterwards. “It was a good thing that it hadn’t been Teller.” Which was then one of the things that I wanted to write down here, so that I didn't forget to ask you about that whole Teller-Oppenheimer relationship. How would you characterize it? Peierls: Well, I was not directly aware of his complaints then, which undoubtedly existed. Teller is a rather prima donna, and he always had his own views about what was important and what he wanted to do at any given time. I think I mentioned that last time, how I came to be in charge of a group because Teller was supposed to look after it. Sherwin: No, I do not think you have mentioned that. Sherwin: This is in '44? Peierls: Yeah, June of '44, I was put in charge of a group. I think it was called Hydrodynamics Group, which was supposed to work on the actual flow of the movement of the uranium and things surrounding the material during the implosion which would start [inaudible]. Sherwin: This was within Bethe’s division? Peierls: That was in Bethe’s division. That was a group which had been headed by Teller, but he wasn't very interested in it and did not really do much about it. It so happened that I had some relevant experience. Sherwin: Who was in that group? Peierls: Klaus Fuchs had come with me. He was a member. He came, I think, months later because he still had things to finish up in New York, but then he joined. I do not remember. Bob Christy, who is now at Caltech, who I think had the main idea about the form of implosion used in the final designs. Sherwin: The main idea about the lenses? Peierls: No, of using a solid rather than a hollow shell. Sherwin: I see. Right. So it was just the three of you? Peierls: Oh, no. I mean, those are the only names I can now remember. There were probably about a dozen, but I am not sure. Sherwin: Okay. Teller simply opted out? Peierls: He then was given another group to think about long-term problems, including particularly hydrogen bombs. Peierls: Yeah, I mean, it was not wrong. If you could spare the effort, it was obviously sensible to keep thinking about that as well, although it was fairly clear it could not be done during that war. Sherwin: When you say he was put in charge of another group, did he do it on his own? Peierls: No, he had in there a number of people. Sherwin: Do you remember who they were? Peierls: Well, Geoffrey Chew, who is now at Berkeley. He was quite young then. He was one of them. Sherwin: Did he have his PhD at the time? Peierls: Not sure. Yes, he probably did. If I thought a long time, I might come up with one or two more names. Sherwin: Okay. Now did you come across any examples of difficulties between Oppenheimer and Teller? Sherwin: Did Teller complain at any point to you? Peierls: Not that I remember. Sherwin: How about with respect to Bethe? You were good friends with Bethe. Sherwin: And Bethe was very good friends at the time with Teller. Peierls: Yeah. But always slightly amused by Teller's behavior, in various ways. Nothing very serious, but he was inclined to make fun of him. I can't recall any specific incident. Sherwin: Mainly with regard to Teller's personality? Peierls: Yeah. Well, as a physicist, I think everybody respects him enormously for his insight and his imagination. He certainly thought of many things that other people hadn't thought about. He can also be somewhat wild. Then he can back an idea for a time which then turns out to be nonsense. But that doesn't matter. Sherwin: Do you think that his habit, or his reputation of doing that, contributed to the skepticism about the hydrogen bomb in the late 1940s? Peierls: No. By that time, he had shown his inclination to be rather wild not in physics, but in political problems. I remember—and this was typical—one visit when he came to England for some international conference probably in '48. In Oxford, was he there? Around that time, there were two things he talked about and advocated. One was world government, and the other was preventive war. Sherwin: World government and preventive war? That's one way of bringing about a world government, if you win the war. Peierls: It may in fact be the only one. Sherwin: It is. Did anybody raise the contradiction? Peierls: Well, people were amused. Sherwin: Was it in the context that, what we really should have is world government, but if we cannot have that, what would we do? Peierls: No, I think these were separate issues he talked about. I, at least, do not remember hearing him connect it. Peierls: No, I did not. Peierls: No, we were there when the bomb was used. My attitude at the time was that I was, as a scientist, not competent to judge the strategic and military implications that would be involved in that. There were other people who understood this. The important thing was that they would be briefed about the scientific aspects. Knowing that Oppenheimer was on a committee and was briefing with the high-ups, I felt two things one could rely on. Oppenheimer put the reasonable ideas across, and one could trust people. After all, we are not terrorists at heart or anything to see [inaudible]. Both these statements might now be somewhat optimistic. Sherwin: Yes. Were you in Alamogordo? Sherwin: What were you doing there at the time? Sherwin: Which bunker were you in? Peierls: Not in a bunker. We were on a hill about ten or twenty miles away. Sherwin: Yeah, I think there were two spots, actually. I assume you were probably at the further one. Peierls: Yeah, I think twenty miles. Sherwin: Who else was there? Peierls: All the people who had no immediate business, guests. Oppenheimer was not with us. What I remember was that Fermi wasn't with us, he was closer. William Laurence of the New York Times was there, because he was to prepare the eventual press releases, which in fact had to be rewritten. Sherwin: I know, I read the originals. My God, I have never seen such purple prose in my life. It was just atrocious. Sherwin: [Laughter] “What was that?” Do you remember any discussions afterwards about using this thing? Peierls: No, I do not remember. I believe I probably wasn't involved in any. Sherwin: After it was used, do you have any recollections? Peierls: My recollection is that many people felt like celebrating, partly because this was in the military sense a great victory, and partly because it had made the work of Los Alamos tremendously important. I think I am right in saying that many of us must felt—giving myself credit there—that it was not an occasion for celebrating. Sherwin: Do you remember who was among that group? Peierls: No. Also then we were very surprised to hear about the Nagasaki, the second one. We didn't quite appreciate the motivation why it had been decided to use this so immediately, without giving the one a chance to act. But again, I felt, I don't know what's going on up there. Sherwin: Was there any talk at all about the use of the second one because that was the implosion device, and that they wanted to see how that works? Peierls: No, they already tested it. Sherwin: They tested it as a device, but not as a bomb. Peierls: The problem of getting it detonated, I mean, these were [inaudible] problems. It's true that on the test site in Alamogordo, there were no houses and or anything that destruction could [inaudible], but for the physicists, these would have made little different. They knew exactly what it would do. You'll know, in fact, that it had about the same power as the other one that had been used in Japan. They were about the same thing. So no, that, I think, was never thought. Sherwin: Certainly not among the physicists. What do you feel is your estimate of the chances that these devices would work, before they were actually used? Peierls: Almost certainty. Certainly the uranium, the 235 one, there seemed no doubt at all. Sherwin: They didn't even test it, they were so sure of it. Peierls: Yeah. With the other one, one could imagine some snags with the operation of the lens systems and so on, which you couldn't really test in advance to quite a degree of accuracy one would like. There was also a possibility some instability might develop. As far as the nuclear physics aspect goes, the thing about it seemed virtually certain. One had to have an open mind because there can always be something unexpected. Sherwin: Was your wife with you at Los Alamos? Sherwin: You lived in what kind of a place? Peierls: In one of the apartments, one of the ex-Army shacks. We had our two children there, because they had been evacuated [inaudible], so of course we took them. Sherwin: How old were they? Peierls: My daughter is more than thirty-three, so she was ten in Los Alamos. One was eight. Sherwin: So they were in the schools? Sherwin: Do you have any recollection of the schools? Peierls: Yes. They were good schools, all staffed mostly by wives of the scientists there. The main weakness was in mathematics and physics because naturally, any wife that has qualifications in those areas got a job in the laboratory and not in teaching school. Sherwin: I see, yes. An interesting paradox, I suppose.